The Partiologist: Back Yard Luau! Wow, the summer days quickly passing by, aren't they? 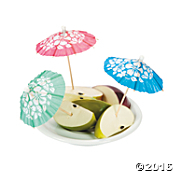 You can slow things down by planning a summer LUAU with the help of Oriental Trading. 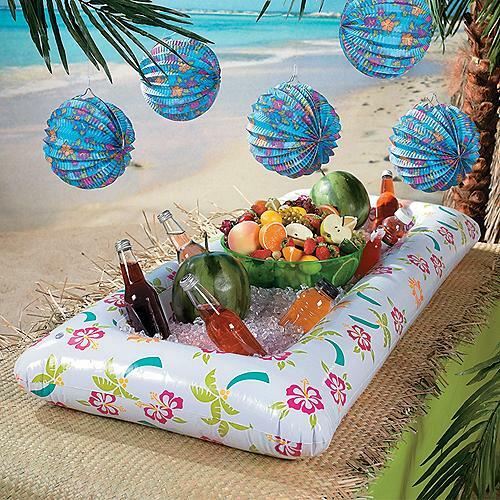 With everything they have to offer in party supplies, you'll find plenty of time for a backyard LUAU! No need to run all over town finding party supplies, Oriental Trading is your one stop party shop! 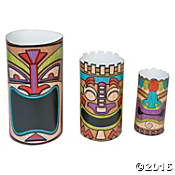 First of all, no Luau would be complete with out Totem Poles and Tiki Huts. Let me show you just what I mean. 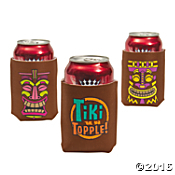 Tiki Can Covers, what a great addition to the party! 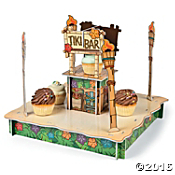 And that Tiki Bar? Oh my goodness, so cute to hold cupcakes or any kind of sweet. Not to mention the Luau Tiki Centerpieces. 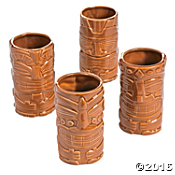 More Tiki fun with the Tiki shot glasses....fill them with a shot of candy! 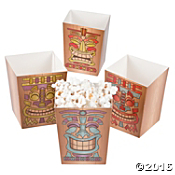 One of my favorites it the Tiki Popcorn Boxes, there are so many snacks that would be perfect in the boxes. 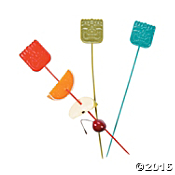 And the Tiki Fruit Kabob Stirrers are the perfect way to serve your fruit. Make them up ahead of time and you'll have more time to enjoy the luau! 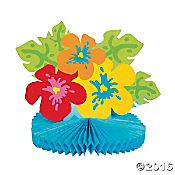 No Luau would be complete without Hibiscus, isn't the centerpiece the cutest? The fun Hibiscus Cocktail Parasol can be used for more than cocktails, although they are perfect to add to the side of a glass! 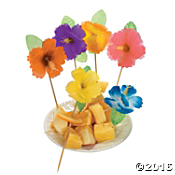 The Hibiscus Picks are full of color for your table, poke them into anything and serve! 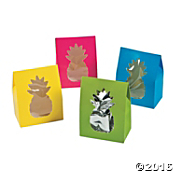 Everyone needs a take home box, so why not a Pineapple Favor Box? 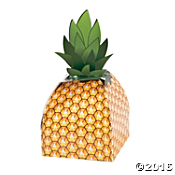 Or a Pineapple Treat Box? 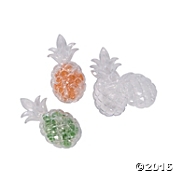 Possibly these are my favorite, the clear Pineapple Favor Containers. 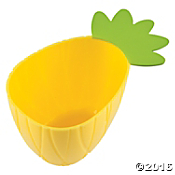 And a Pineapple Dish at each place setting would be perfect to serve the salad or fill with treats. 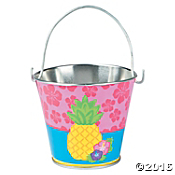 I am always a sucker for little pails, cute Bright Pineapple Pails! 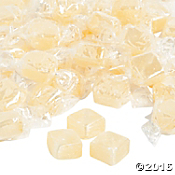 Don't worry, I've got the perfect thing to fill all the favor boxes...PINEAPPLE CANDY CUBES! Oh my goodness, they sound so refreshing, don't they? The list goes on and on, this is just a sampling of a few of my favorites, be sure to check out everything they have to offer for your LUAU. And if you're looking for PARTY FAVORS, you can find them for any occasion. This may not be something you might think of, but it is a brilliant idea for an evening party. One of my favorites any time of year is the PEANUTS gang! You can bring your summer celebrations to life with help from Peanuts. So many reasons to celebrate this summer. Be sure to let ORIENTAL TRADING be a part of your party! Now I want to throw a luau party. So many fun decorations and ideas! I love a luau...Especially in Hawaii! But having a few close friends and decorating it up looks like a lot of fun! thanks for getting me inspired!!! A backyard luau is the next best thing! looks great-where did you find the blow-up container you used for the food and ice? Thank you Debra! The blow up container for food and ice were also from Oriental Trading, however I just checked and don't see it anymore, they may be out of stock at the moment.